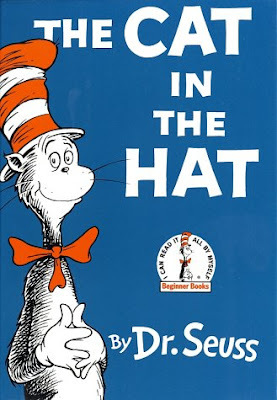 Today we read The Cat in the Hat! This is a favorite of mine, as a child I used to dream of the Cat coming to my house on a rainy day! There is nothing better than sharing a favorite book with your child! Jake enjoyed the story! He always laughs for Dr. Seuss books! Next, we made our own Cat in the Hat- hat. I cut strips of white and red paper and had Jake glue them on a black paper cut out in the shape of a hat. This is a great way to practice patterning as well as motor skills. Jake had to glue the hat then place the correct color strip on the hat. He did a great job patterning without any problems! So proud of his hat. "Me Cat in Hat!" For a copy of this month's plans click here.